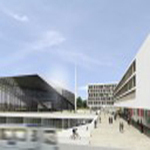 The Ecole Polytechnique Fédérale de Lausanne (EPFL) is to open Europe's first fully automated convention centre in 2012. Located just under 40 miles from Geneva, the venue will have a capacity of just over 3,000 and will include a 2,200-seat conference room with an 880-seat balcony, as well as fifteen fully modular meeting rooms on a garden level. The EFPL is located on the shore of Lake Geneva and is one of the two Swiss Federal Institutes of Technology. Its mission is threefold: education, research and technology transfer at the highest international level.